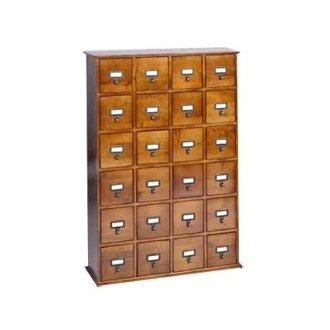 Storage furniture is usually of a wooden or metal nature and can be quite bland. 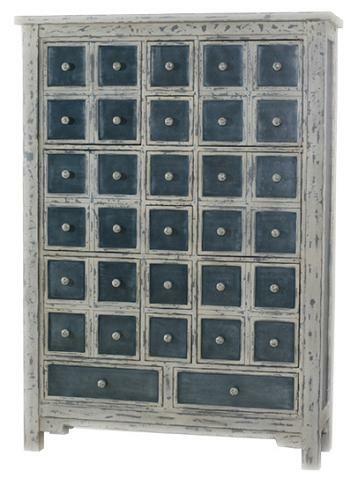 However, this beautiful quilt fronted chest of drawers is anything but ordinary and is as eye-catching as it is unusual. The chest of drawers consists of 20 drawers and 2 doors, each decorated with a front of quilting patterns symbolic of nature and indeed farming. If you’re looking for a storage item of furniture with colorful decor, then this Jean Chest of Drawers is one to be considered. 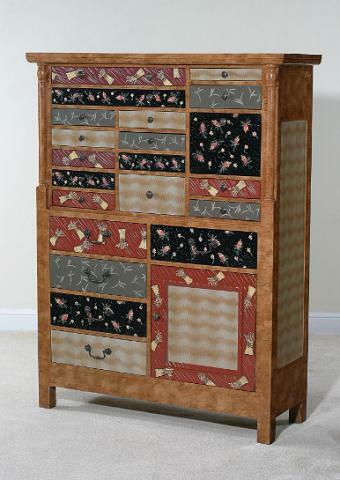 There are 4 different patterns to the quilting on the front of the drawers and doors. Three are inspired by the flora and fauna found in meadows and country lanes whilst the fourth could be considered a representation of water or the curtains of a country cottage or farm house. The quilted red background of the wheat clusters contrasts well with the quilted black background that forms the basis for what could be strawberries or red petals of some kind. The beautiful quilt front chest of drawers is similar in many ways to a quilted bedspread. Owing to the decorations represented in the quilted drawers and doors, this chest of drawers would look particularly good in a country house setting perhaps with weathered old floorboards beneath. However, that said, it would compliment a modern urban interior which needs an injection of color and country designs into what could be a white and bland space. What I like most about this quilted chest of drawers is the differing sizes of the many various compartments. The inner child in you will be fascinated with what can be hidden and placed in each drawer, rather like a squirrel hiding precious nuts away for Winter. At the top, a tiny flat drawer looks an ideal place for letters to be stored whilst at the base a large square cupboard compartment can be used to store shoe boxes and bags. The patterns of nature which appear on this quilt fronted chest of drawers will add a decorative element to a room which would not otherwise be found with more regular wooden storage furniture pieces. This means focus on intricate decorations can be moved elsewhere whilst the Jean Chest of Drawers fulfils two functions in one. It has form and function in equal measure. You can buy this quilt fronted Chest of Drawers from this location: Quilt Fronted Chest of Drawers With Patterns of Nature. The dimensions and price of this piece can be obtained via the page noted above. As an atheist I was intrigued when I came across this original chest of drawers which is part of a project called ‘Object for Atheists’. The furniture piece itself is given the rather mundane label LKBP which belies the fascinating philosophy behind the creation. It’s designer is the Dutch multimedia artist Guy Keulemans who is based in Eindhoven and also in my old city of Berlin. 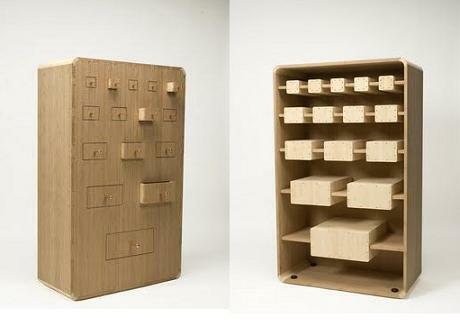 The concept behind this Object for Atheists chest of drawers is the relationship between religion and aesthetics. A thesis project Keulemans is working on led him to research more about the ethnography of online atheist groups. The chest of drawers thus became a study and metaphor on the need for ‘some’ atheists to delve into and expose the mysteries of religion, science and existence. 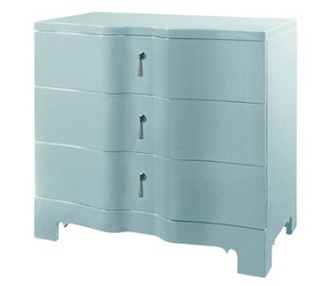 The LKBP chest of drawers that are also a set of shelves therefore provide an ‘inversion of aesthetic function’. At the front are a series of drawers which open up as any regular drawer would and can be used for storage, whilst at the back, hidden from view until the furniture piece is turned around, are secretive shelves where objects can also be placed. The LKBP rests on castors which allows for easy movement and turning. The shelves at the back represent the secrets to be discovered in science and existential philosophy which supersede the secretive nature of the drawers. This Object for Atheist’s piece is made from sustainably harvested bamboo. Further environmentally friendly construction methods are used in the form of dovetail joinery which does away with the need for nails and screws. The philosophical point of the chest of drawers means it can be placed against a wall or in the center of a room and of course, moved about depending on one’s decor tastes and frame of mind. You can read more about this LKBP furniture piece which is part of the Objects for Atheist research project, as well as the project itself, here: Guy Keulemans Objects.